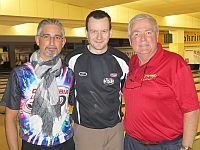 Paul Moor (center, with Tournament Director Thomas Gross, left, and Mike Quitter, right, Tournament Ambassador for Ebonite International) of England threw eleven strikes to become the first left-handed winner of the 12th Columbia 300 Vienna Open Sunday evening at Plus Bowling in Vienna, Austria. Moor, who broke a tie with Osku Palermaa for the most titles on the European Bowling Tour two weeks ago in the Chandra Open, defeated Tommy Jones, United States, 265-219, to win his 15th career EBT title and the 7.000 Euro top prize. Moor averaged 222.47 for 19 games today and led the tournament in Final Round 2 and 3 to earn the No. seed for the stepladder finals. In the opening match between two PBA champions, Jones, seeded fourth flew past two-time Vienna Open champion (2010, 2012) Chris Barnes, United States, with a turkey from frame 3 and a five-bagger from frame 7, 255-205. Jones started the semifinal match against No. 2 seed, Joonas Jehkinen of Finland, who won his lone EBT title in the 2013 Track Dream-Bowl Palace Open in Munich, Germany, with another five-bagger and never looked back. L-R Tommy Jones (2nd), champion Paul Moor, Joonas Jehkinen (3rd) and Chris Barnes (4th). Jehkinen, who averaged 245 in Round 3 to rocket from 11th to second place, left 7-9 and 3-7-9 splits in frames 4 and 6 which resulted in open frames. Though Jehkinen struck on five of his last six shots, Jones put the match away with a double in the eighth and ninth frame for a 231-203 win. Jones started the title match with three strikes. Moor countered with a double but left a 4-6-10 split in the third frame which he almost converted to a spare. Jones spared the 6-10 combination in frame four, then gave the advantage back when he failed to convert a 7-pin. Both players started striking, Moor from the fourth to the eighth frame and Jones from his the sixth to the ninth frame. 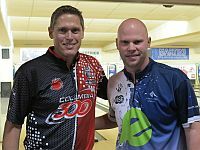 Finishing First, Moor threw another four strikes to shut out the 15-time PBA champion, who was looking for his first title on the European Bowling Tour. Jones received 5.000 Euro for second place. Jehkinen took home 3.500 Euro for third place and Barnes, who made his fourth appearance in the stepladder in his fifth Vienna Open, earned 2.500 Euro for fourth place. The tournament drew 280 player from 28 countries. Barnes and Jones (left) won the Doubles competition and split the 1.600 Euro top prize. Diana Zavjalova (right) of Latvia was the best of 41 woman in the field in 10th place to win the women’s ranking in Vienna. 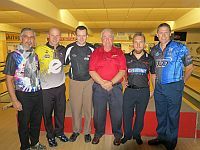 The 12th Columbia 300 Vienna Open was the 16th stop of the 2014 European Bowling Tour and the last of six “gold” tournaments this season, the second-highest of four EBT categories. Players competed for total prize fund of 73.130 Euro or approx. $ 100,000 – 62.900 € for Singles and 10.230 € for the Doubles event. The VO14 was contested on the 38 feet 38 feet lane conditioning pattern with 24.605 mL volume oil total. Download the LaneMap™ Guide to get all information on Plus Bowling. For the 12th consecutive Bowlingdigital covered the 12th Columbia 300 Vienna Open live from Plus Bowling in Vienna commencing Thursday, Oct. 2 all the way through to the stepladder finals on Sunday, Oct. 5. Qualifying ran from Monday, Sept. 29 through Saturday, Oct. 4. Women received 8 pins handicap each game, an equality handicap provided to women in every event on the European Bowling Tour. Total 64 players qualified for the finals on Sunday, Oct. 5. The top 8 qualifying leaders received a first-round bye. The other 56 players bowled six games starting from scratch. The top 22 joined the top 8 qualifiers in Round Two. Those 30 players bowled another six games starting from scratch after which the field was trimmed to the top 18, who carried the pinfall forward into Round Three. After another six-game block the top 4 players with the highest 12-game total advanced to the stepladder finals. 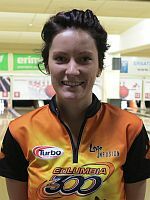 The 17t EBT event, the Norwegian Open 2014 by Brunswick, a European Bowling Tour “Satellite” tournament, started on Friday, Oct. 3rd and runs through Saturday, Oct. 11th at Veitvet Bowling Center in Oslo, Norway. 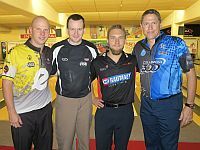 Bowlingdigital will report live from Oslo commencing Thursday. Championship: No. 1 Moor def. Jones, 265-219. Click on the matches to view frame-by-frame results.